How do we engage the people who are coming to this history through Hamilton? Having considered the gaps in the stories told by the show, how do we bring that history to people who are, in my anecdotal experience, eager to learn more? While offering further reading on the period or pointing people to existing programs are good places to start, I think we can do more. 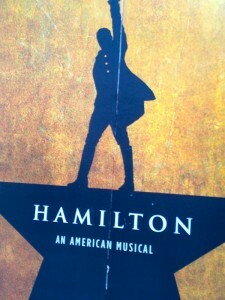 To truly connect with the populations who are flocking to Hamilton: An American Musical, we need to look beyond the historical period and consider what makes the show popular. The music is strongly rooted in hip-hop, rap, and r&b, but there are also nods to classic broadway, even Gilbert and Sullivan; Miranda is speaking in a voice that is familiar and accessible to a wide range of people. Moreover, audiences who have never set foot in the theatre (either the Public or the Richard Rogers) have been welcomed by Miranda and the show’s cast in various forms of online engagements. Miranda, who like his title character seems to work non-stop, frequently converses with fans on twitter and has joined tumblr where he reblogs and likes fans’ posts. When someone added the lyrics of the show to Rap Genius and the community started annotating, he expressed delight and even noted (again on twitter) when people guessed correctly about a riff or other fact. Members of the cast and crew have live-streamed events on SnapChat and Facebook. Interactions between the cast and crew of Hamilton and its audience – its fandom – are conversational and egalitarian to a large extent. When the audience creates annotations, transformative works, YouTube videos, the official Hamilton community generally responds with praise or gratitude. The creators of Hamilton have embraced their fan community and recognized its voice as a valid participant in the expression of the show an experience, as a cultural moment. The challenge as I see it for public/digital/early american historians who want to catch the wave of Hamilton’s popularity to expand the understanding of the show’s fans is to find ways to communicate which echo the accessible tone of the show and which convey a sense of shared experience where the non-expert is welcomed and celebrated. We should try to share our enthusiasm for the past with them, and welcome their enthusiasm or concerns in return, instead of imparting knowledge. Conversation, shared authority, a willingness to allow emotion to be part of the experience of history, are all useful tools as we try to convey the rich history of late eighteenth- and early nineteenth-century America. A note: I started drafting this post last week, before attending the 2016 Annual Meeting of the National Council on Public History, whose theme was “Challenging the Exclusive Past.” Every day of the conference brought me new possibilities for creating a more inclusive interpretation of the past, as well as the challenges which exist. It reiterated what I had been thinking about when I began writing this post: that we need to create an inclusive (public) history of the Revolutionary/Early National era, telling the stories of the wise range of peoples of many races, ethnicities, gender identities, and classes who lived through this period and including our publics as participants, not an audience, when we do so. The dead may have no control who lives, who dies, who tells their story, but the living should have a say. On my way back from Poughkeepsie, I stopped in New Paltz to visit Historic Huguenot Street, which popped up on my twitter feed on Sunday evening. Once I arrived, I realized I’d been there once during my college career, but only to wander around outside, never in the buildings, and moreover they’re in the process or renewing their interpretation. 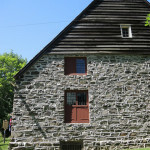 One interpretive choice they’ve made is to pair two 18th century houses. One is unfurnished, so you can see the architectural features and the way the construction progressed over time. The other house is fully furnished with pieces that are (mostly) appropriate to the period interpreted. Our guide was explicit about the comparison, particularly when we were in the basement kitchens of the two houses. In the unfurnished house, the kitchen felt smaller, there was less natural light and little artificial light, and the overall feeling was depressing. The kitchen in the furnished house had more light, natural and artificial, and seemed almost cheerful in comparison. However, our guide reminded us that the space would have been smoky and smelly, and that in the 18th century the people working in the kitchen would have been enslaved African Americans. I appreciated the contrast as part of an overall effort by the site to make the act of interpretation transparent. Both guides I had explicitly stated “we have decided to interpret” and we were even asked if we thought the comparison of furnished and unfurnished was helpful. When I was working in a historic house in Virginia, we often talked about whether to interpret areas for which we had little or no documentation, in particular the upstairs bedchambers. Do you fully furnish a house, even without evidence? Or leave rooms empty, knowing that visitors often expect to see “what it was like”? And if you are guessing, what do the guides/docents tell the visitors? Historic Huguenot Street has the advantage of having multiple houses, but they could have chosen to interpret them all one way or the other. I think the decision to show the two paths interpretation can take, and in sequence, not only helps visitors think about the past but also how the past is presented to them at historic sites. I look forward to returning for a more leisurely visit the next time I’m in the area. I’m curious to interact with the first person interpreters, and see where else the education and interpretation goes. 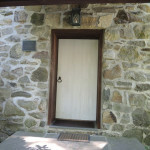 My experience was a little off the usual, because I had a guide for all of the houses, when some of them usually have first person interpretation (they started the tour a little early for me since I had to drive back to Virginia). 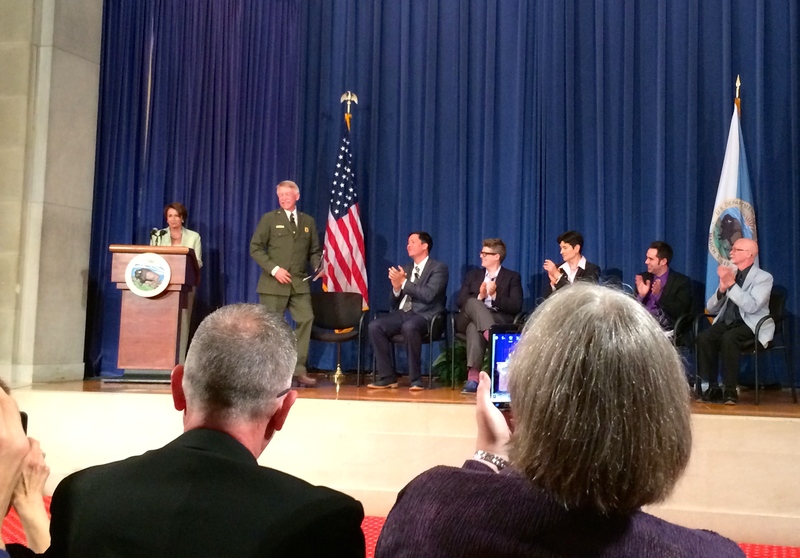 On Tuesday, I attended the Department of Interior’s inaugural panel discussion for the new theme study on Lesbian, Gay Bisexual, and Transgender (LGBT) history in the National Park Service (NPS). The study is part of a larger effort within NPS to ensure that the histories of minority Americans are included and communicated in their sites. 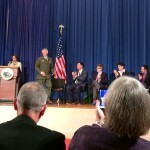 The panel opened with remarks by the National Park Service Director Jonathan Jarvis, followed by Secretary of Interior Sally Jewel and John Berry, who is Ambassador to Australia and one of the first openly gay ambassadors in the United States. In her remarks, Secretary Jewel stated that “place matters” but LGBT communities have not had places to mark their significance to the larger American story. She talked about the need for young people who are struggling with their identities to hear their story told in a way that helps them realize that they are not alone. When I was in middle school (at a private school), we had to do these self-evaluations at the end of every quarter, for every class. I think each on was about 3 pages long, and they asked about how we thought we were progressing, and what project we liked best, and what we thought our strengths and weaknesses were. No one I knew liked doing them. It wasn’t that we were 10-14 year olds being asked to evaluate our own performance, it was that we neither saw nor knew how they were used. As far as we knew, they just went and sat in a file, maybe emerging for parent-teacher conferences, but we could not see any impact the evaluations had on our daily lives at school. I mention this because one of the main impressions I got from this week’s readings was that evaluation processes need to have and be driven by Purpose. Evaluations should contribute to the ultimate goals of a project in some and not just be another hoop to jump through. The feeling of throwing data down a hole is discouraging; returning with useful data which can improve your project or show that it’s being used is rewarding. Evaluation should be a means as well as (or instead of?) an end. That said, I don’t know that I’m ready to run complex evaluations on my own. One of the projects on which I’ve been working at RRCHNM has included periodic testing, which I count as a sort of ‘formative’ evaluation (to use a term from Birchall et al). Periodic in-process evaluation helps us make sure we’re heading in the right direction and readjust course as needed. Watching the evaluation process, sometimes participating, is helpful for me, at least. Think of it as the lab half of a science course, conducting experiments while still reading the texts. From this week’s readings, I have an idea of what makes for good evaluations, both in development and use. Keep the goals of the project in mind, think about outcomes not output, look for your strengths as well as weaknesses when reading the data (Preskill). Bear in mind the variety of user experiences before, during, and after interacting with your project (Kirchberg and Tröndle). Consider how you’re planning to use the evaluation findings when deciding what sort of evaluation(s) to conduct (Birchall et all). Make sure the findings are readable and accessible to the people who need them, up to and including training people how to read them (Villaespesa and Tasich). These are only soundbites, obviously, but they capture some of the ideas I’m storing for future use. Elena Villaespesa, Tijana Tasich, “Making Sense of Numbers: A Journey of Spreading the Analytics Culture at Tate,” Museums and the Web 2012. Banny Birchall, et al., “Levelling Up: Towards Best Practice in Evaluating Museum Games,” Museums and the Web 2012. Hallie Preskill, “Museum Evaluation without Borders: Four Imperatives for Making Museum Evaluation More Relevant, Credible, and Useful,” Curator: The Museum Journal 54:1 (Jan. 2011): 93-100. Kirchberg, V. and Tröndle, M. “Experiencing Exhibitions: A Review of Studies on Visitor Experiences in Museums.” Curator: The Museum Journal 55:4 (Oct. 2012) 435–452. The question, since it’s not on the syllabus, was: what difference does new media make to doing history? Reflect on your time with us this semester. I want to address these in two sections. First, the disclaimer that I am a new media fan, have drunk the kool-aid, etc. I think there are number of ways that new media makes a difference to the practice of history, and the class does an excellent job of covering them. What follows is just what I’m particularly excited about these days. Something profound happens when you work transparently—when you have to summon up your courage to listen to people and shape complex ideas out in public every day. Your work becomes more about humility than about your own authority and expertise. And somehow, magically, the work product gets better and better. From the article: Tim Grove, “Grappling With Radical Trust”, History News (July 2010). In September I attended the AASLH annual meeting in Richmond. One of the sessions I wanted to attend, but didn’t get the chance, was led by the editors of a recent work titled Letting Go? Sharing Historical Authority in a User-Generated World. If you follow the link to the publisher’s page, you can read the table of contents. Although the book is focused more on the museum community and pubic history, it came to mind when I was reading the articles and essays assigned for this week. Written history, academic history, often seems to be written with the idea of authority, either in finality or in a closed conversation. One of the apparent consequences of the “professionalization” of history (( Generally used to describe the late 19th century creation of a distinct identity for historians working in the academy )) has been historians writing and “doing” history for other historians. This is not in and of itself problematic, but it has led to an assumption that everyone speaks the same language and knows (and will follow) a similar set of rules. Citizen history changes the rules and the language. Of course, the rules and language were never as set in stone as some would think. Historians working in museums or otherwise with the public have been aware of that, whether or not they accepted it. A curator can write clear label text, carefully construct an exhibit and educational program; there will still be visitors who ignore all the presented information, or who read what you have written in a completely unexpected way. The divergence of intended and received information can be seen as a failure, but how we react to that failure can change, in fact seems to be changing. From my entirely self-informed understanding of 20th century educational and museum history, there was for some time an attempt to change the behavior of the visitor. The exchange of information, whether from a curator or academic historian, was one way: into the audience. The challenge which is now being voiced by some, including (I believe) the editors and contributors of Letting Go, is to start a conversation, to engage the audience in a conversation, and moreover to listen to them. Giving voice to the non-experts is scary. How can we give up the authority that we have earned through hours of work, reading, and all those graduate classes? What if they don’t listen to us? What if they are wrong about something, or say that we are wrong? On the other hand, listening to the non-experts is exciting. When they realize how broad and deep our knowledge is, they respect all the hours of work and reading (well, most of the time). If we listen to them, they may be more inclined to listen to us. At times, they may still get it wrong. The main concern I have seen in citizen history, both in my own experience and in the readings, is a fear that the public will misbehave – commit vandalism, break the tool or the site. It is expecting the absolute worst behavior of people. Certainly, there will be some vandals. There will be the one person who stands on the left side of the Metro escalator, who talks loudly on their phone in the quite train car, who speeds recklessly on the highway. There will still be all the other people standing on the right, reading quietly, and driving within 10 MPH of the posted limit. We should give those people a chance. Moreover, we should be excited to give those people a chance. They can be extremely passionate about things that interest us, or even things that do not. As Roy Rosenzweig mentions in his article about Wikipedia, the user-generated encyclopedia “offers a detailed 3,100-word article titled “Postage Stamps and Postal History of the United States,” a topic with a devoted popular following that attracts little scholarly interest.” Although not generally applicable or usually publishable, this group of wikipedians might prove helpful should a curator at the US Postal Museum run into a thorny problem. Moreover, once a community of participants has established itself, they will help to keep down the number of vandals and troublemakers. Full disclosure: I have an account to edit Wikipedia. Just this past week I was reading an entry and noticed that someone had added “youll love these awesome deals” to one of the references. So I went in and made a minor edit. Users may have their differences, but in general I think the citizen historians are interested and excited to be included in a meaningful historical project. Back in high school I had this idea for a field trip in a van. It was going to be what I did after college (where I would, of course, double-major in theatre and history), and it went more or less like this: most public schools these days have trouble getting the resources (time, money, manpower) for field trips, but field trips to historic sites were some of the best times for me as a kid, because you got to be where the past happened. ((In the words of one of the kids Sheri took on a house tour, you get to “touch history”)) In order to bring that experience to schools, I was going to get a van and fill it up with objects, clothing, and build a whole educational workshop that could go for a class period or half day in whatever space was available. One of the features that I concocted was a map mash-up which would help students see the historic landscape and the modern simultaneously. There would be a map, probably the historic map, printed large so everyone could see; the other map, say the modern street map, would be printed on overhead projector type clear plastic so it could overlay the historic one. I thought the visual collision of past and present would help other kids see how history is related to the world around us, in the roads and fields and buildings. Needless to say, I never got around to making the field trip in a van, but the map idea stuck with me. Which is why I really enjoyed a number of the sites on the syllabus for this week (11), which are using digital tools to make a much more sophisticated version of a historic/modern map mash-up. Hypercities is only currently configured for select cities, but the interface is good. It allows users to select a time range and to increase or decrease the opacity of the historic map(s) which overlay a modern satellite view. Some of the cities have only a few maps; London apparently only has one, but it’s John Snow’s cholera map! Map overlays or mash-ups aren’t, of course, the only sort of visualizations available for historians. The variety adds to the use, and I find visualization tools personally useful. I am the sort of person who makes mind maps, writes and reads simple entity-relationship diagrams for relational databases, and appreciates a good flow chart. However, when I remember my high school plan and impulse, I look at the visualization tools another way. Visualization tools can help a historian analyze their data, but they can also make that data more comprehensible to an audience, whether scholarly peers, students, or the public. It could be in the form of an argument, where the visualization illuminates an aspect of the data which is otherwise buried. It can also be in support of an argument, for example a relational diagram which highlights what aspects and relationships were considered most important in the data. For this second form of visualization, the trick is making something which is true to the data and comprehensible to the reader. Even my low-tech overhead sheet map wouldn’t work for a group of students who had no idea how to read a map. Provide a key, define your terms. A visualization may be gorgeous, but if you’re the only one who can understand it, what’s the point? Every year in the spring, my friends who are historical reenactors go to two events: Military Through the Ages, at Jamestown (MTA), and Marching Through Time, at MariettaHouse Museum in Maryland (MTT). Although the two events are quite different in scale and outward tone, the basic concept is the same. Groups that interpret military companies or troops from various periods come and are arranged in chronological order, and visitors can walk in whatever sequence they want, asking questions and seeing the progress (or regress, depending on your path) of military technology and tactics. And I have found that, with the seventeenth century, groups like the Sealed Knott Society in England, the reenactment group, they do some very good work. Someone takes an interest in shoemaking or building construction and they write little papers about what they have learned. They are just not about shooting but are deeply interested in the history and make contributions. Among other things (which I hope to come back to in future posts) I was struck by the phrase “seventeenth century.” Other than some early colonial sites on the east coast, and Spanish sites out west, there isn’t much seventeenth century history being told in the US. Moreover, pre-seventeenth century history is most often seen statically, in museum displays, or in two dimensions on film and in print. At this point, I think I should clarify something about my reenactor friends. One or two go to events like Military Through the Ages with 20th c. groups. A few are part of a Jacobite regiment, from the 1745 Stewart uprising. But most of the people I know are part of two groups: La Belle Compagnie, which interprets the 1380s, and Lord Grey’s Retinue, which focuses on the 1470s. For the first time, after reading the article and my friends’ posts about their weekend of interpretation, I was struck by what a unique opportunity they offer in the US. When I was in Scotland, you could go to any number of castles or other historic sites and find people, professionals or amateurs or both, interpreting everything from the Roman era to post-World War II rationing. 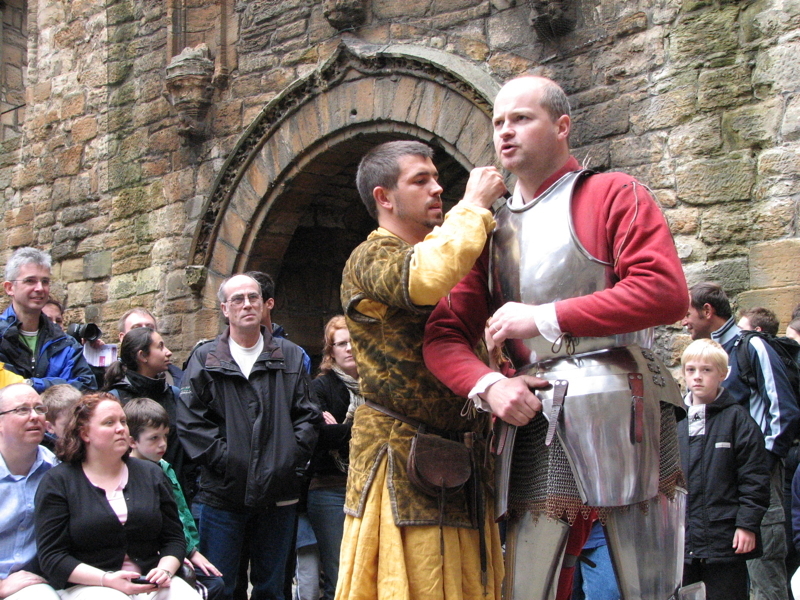 The picture at left is from a tournament weekend at Linlithgow Palace, a huge draw for people of all backgrounds; throughout the day this man demonstrated the process of putting on armor at the time of the Battle of Flodden (1513), and pointed out the differences between his armor, as a noble, and that of his vassal. In the United States, I am not aware of places that offer regular access to pre-1600 interpretation for any culture (Asian, African, or European, although I sincerely hope there are some Native American/First Nations). Looking back to when I was a kid, I know that as much as I loved reading, seeing people demonstrate martial and material culture would have had a much greater impact. In fact, I know it did, because I vividly remember what living history interpretation I did see. What it means to me is that my friends, who are by day programmers and military personnel, stay-at-home parents and bankers, are also some person’s first experience of tangible wonderful history. It might be the man demonstrating cooking, or the woman with the spindle, or just seeing the parent and children running around playing with toys appropriate to the period of interpretation. They are bringing to life a period and area of history which does not, in this country, have a physical presence, and in a way which is purposefully accessible to the public. I think that’s wonderful. 1 Ivor Noël Hume and Henry M. Miller, “Ivor Noël Hume: Historical Archaeologist,” The Public Historian, Vol. 33, No. 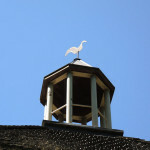 1 (Winter 2011): 25.